By Wendy Lee • THE TENNESSEAN • January 30, 2009 Dell Inc. said it plans to close the part of its Lebanon, Tenn., facility that manufactures desktop computers on Friday, due to weaker sales for the products. The closure will move 250 to 300 employees from Lebanon to Nashville, Dell spokesman Ken Bissell said. Some employees who previously built desktop computers would now either be boxing, shipping or handling materials in the company's Nashville distribution center off Murfreesboro Road, he said. The news comes as overall demand for PCs industrywide has declined, hurt by falling home prices, weaker stock values and skittish consumer confidence, said Framingham, Mass.-based research firm IDC. All that leads to deteriorating credit in the corporate world and depressed consumer spending. Dell's shipments of personal computers have slipped 6.3 percent compared with a year ago, according to IDC. "We're managing our volumes (manufacturing operations) by shifting capacities to other production facilities," said Bissell, who declined to give specifics. Way to reduce costs The Lebanon facility has manufactured desktops since it opened in 1999. The remaining workers there will continue to refurbish desktop PCs, with about 250 to 300 employees remaining in Lebanon, Bissell said. Employees were informed earlier this week and the transition to the Nashville facility begins next week, Bissell said. The decision is part of a larger initiative within Dell to reduce operating costs. Dell announced last March it would have $3 billion in planned cost reductions by the end of fiscal 2011. Dell's net income declined 5 percent to $727 million during its third quarter ending Oct. 31, compared with a year earlier. Third-quarter revenues declined 3 percent to about $15.2 billion, the company said. Dell has four Tennessee facilities, including the one in Lebanon, plus two distribution centers in Nashville, and a call center here that houses sales and technical support staff. Employers have their pick of applicants as state sees worst job market since 1986 By Chas Sisk and Wendy Lee • THE TENNESSEAN • January 30, 2009 A year ago, Buckley left Memphis for a job welding and bolting steel components for the Terrazzo condominium in the Gulch. After a July layoff, Buckley, 51, found himself out of a job, out of his apartment and out of luck. "I'm homeless because I can't work," Buckley said Thursday at a Nashville job fair for military veterans. The labor market has tightened across Tennessee, as all 95 of the state's counties posted a rise in unemployment in December, according to data released Thursday by the state. The Nashville-Murfreesboro area reported 6.5 percent unemployment, up from a 4.2 percent rate a year ago. Some rural counties in Middle Tennessee were much worse off — with rates as high as 11.3 percent in Smith County. In the Nashville metropolitan area, the ranks of the unemployed surged past 50,000 people, and thousands more are thought to be underemployed as the state wrestles with its worst job market since 1986. Many companies have slowed investment in their operations, and people fortunate enough to have jobs have held onto them more firmly, leaving fewer employment opportunities for those out of work. It's in this environment that Buckley has been trying to find work. He has sent résumés to 50 employers, trolled online job listings, and even flagged down truck drivers hoping for tips on openings at their companies. Each time, the answer has been the same: Maybe they'll hire, if things improve later in 2009. "That's not just one company," Buckley said. "That's almost every company I went to." The tight jobs market has made it hard for people to advance their careers. Adrian Edsall, 29, earns $15,000 a year teaching classes on health and safety as a part-time instructor at Middle Tennessee State University. He longs for higher pay to provide "a better lifestyle" for his 4-year-old son. Like Buckley, Edsall searched for a better job at Thursday's career fair. He has applied for 300 positions, including jobs such as a customer service representative, since being medically discharged from the U.S. Air Force in 2007. He has been turned down for several positions on the grounds that he is over-qualified. He jokes that he will soon list only his high school diploma on his résumé. "I've not found a better job than the one I have," Edsall said. Employers at the job fair at LP Field seemed to have their pick of applicants. URS Corp., a U.S. military vendor, said it would hire about 50 percent fewer people than a year ago for its Anniston Chemical Agent Disposal Facility in Alabama, in part because fewer people are leaving the facility, said Rhonda Ford, a human resources specialist. "Because of the economy, we haven't lost anybody," Ford said, adding that she sees more white-collar job applicants these days. Meanwhile, others are considering renewals or first-time hitches in the military amid the slower civilian job market. The Tennessee Army National Guard has seen a 20 percent to 25 percent increase from a year ago in people expressing interest in joining, said Sgt. 1st Class Julius Santini. He described it as the biggest surge since just after the Sept. 11, 2001, terrorist attacks. "When people are losing their jobs, they are looking for stability," Santini said. Rural counties worse Nationally, on Thursday, the U.S. Labor Department said the number of people continuing to receive unemployment benefits reached a seasonally adjusted 4.78 million for the week ending Jan. 17 — the highest level on records that go back to 1967. As a proportion of the work force, the latest total is the highest since August 1983.Companies across a variety of industries have been slashing their payrolls by the thousands. Starbucks Corp., Eastman Kodak and Allstate Corp. became the latest major employers to announce big job cuts — 7,000 at Starbucks, 3,500 to 4,500 at Kodak, and 1,000 at Allstate. "It seems like we've gotten through the financial crisis. Now we're dealing with global synchronized recession," said Brian Battle, vice president of trading at Performance Trust Capital Partners in Chicago. In Middle Tennessee, even as jobs become harder to find in urban areas, they are even scarcer in the state's rural areas. Thirty-six counties now have an unemployment rate higher than 10 percent, including Macon and Smith counties. Hardest hit has been Perry County, 90 miles southwest of Nashville. It has been reeling since the auto parts maker Fisher & Co. moved to Mexico in September. In December, Perry County's unemployment rate topped 20 percent, and many more are under-employed, said John Carroll, the county's mayor. Workers at another major auto parts plant have been working on reduced shifts. "We need more employers in the area," Carroll said. "We're trying to attract, but nobody is having a lot of success. A lot of people are not turning loose of the money and investing." Chas Sisk can be reached at 615-259-8283 or csisk@tennessean.com. Wendy Lee can be reached at 615-259-8092 or wlee@tennessean.com. Channel 5 News (AP) WASHINGTON - The House has defeated a bill to postpone the upcoming transition from analog to digital television broadcasting by four months to June 12. House Republicans succeeded in scuttling a bill to delay the transition, which is scheduled for Feb. 17, less than two days after the Senate unanimously passed the plan. The defeat is a setback for the Obama administration and Democrats on Capitol Hill, who fear too many Americans are not ready for the switchover. The Nielsen Co. estimates more than 6.5 million U.S. households that rely on analog television sets to pick up over-the-air broadcast signals could see their TV sets go dark next month if the transition is not postponed. Tennessean The group that campaigned to make English the official language of Nashville filed its overdue lists of donors and expenditures today, but Metro attorneys refused to release the information. The exact reason for the delay was unclear. Davidson County Election Administrator Ray Barrett said the Metro Law Department had instructed him not to release Nashville English First’s campaign financial disclosure forms to The Tennessean and other media outlets that requested them. Barrett said attorneys had cited a letter Nashville English First President Jon Crisp sent the election commission on Jan. 15, the day the disclosure was due. Crisp asked for an extension, saying his group’s donors could be subjected to threats if their names were released before the election. Metro Law Director Sue Cain could not be reached for comment Monday evening. The proposed Metro Charter amendment would have required the city to do business in English only. Voters rejected the idea by a 9,000-vote margin Thursday. Contact Michael Cass at 615-259-8838 or mcass@tennessean.com. Associated Press • January 26, 2009 CHICAGO -- Home Depot Inc. plans to eliminate 7,000 jobs while closing four dozen stores -- including one in Nashville -- as the recession continues to batter the nation's housing market. Its shares climbed more than 5 percent in morning trading. The nation's biggest home improvement retailer said Monday the cuts will affect about 2 percent of its 300,000 workers and cause the Atlanta-based chain to record a $532 million pretax charge, most of which will be recorded in the fourth quarter. Most of the cuts affect workers at Home Depot's 34 Expo Design Centers, five YardBIRDS, two Design Centers and HD Bath, a bath remodeling business with seven sites. Those stores will close in the next two months. In Nashville, the Expo store in the 100 Oaks area at 2421 Powell Ave. is scheduled to close.Home Depot said its Expo business, which sells everything from throw pillows and sconces to bathtubs and vanities, hasn't performed well financially, even during the recent housing boom. It said the chain has weakened significantly in the current economic environment. "Exiting our Expo business is a difficult decision, particularly given the hard work and dedication of our associates in that business and the support of our loyal customers," Chairman and Chief Executive Frank Blake said in a statement. "At the same time, it is a necessary decision that will strengthen our core Home Depot business. "The company's core Home Depot stores won't be affectedHome Depot's plans also include 2,000 cuts to non-store jobs, including 500 workers in its corporate headquarters, while freezing the pay of its officers.Home Depot said it would record an additional $163 million in pretax fourth-quarter charges along with a $55 million post-tax charge related to the 2007 sales of HD Supply.Meanwhile, the retailer also updated its 2008 guidance, saying it expects sales to fall 8 percent for the year while profit tumbles 24 percent when it releases fourth-quarter and full-year results on Feb. 24. Neither figures take into account the charges announced Monday.Analysts expect the company to earn 16 cents per share on revenue of $14.8 billion for the fourth quarter.In 2009, the chain said it expects sluggish sales to continue and plans to reduce capital spending by about $1 billion. It will open 12 stores this year.Home Depot shares climbed $1.16, or 5.3 percent, to $22.88 in early trading Monday. 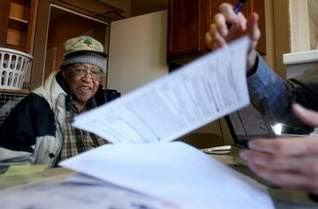 Brad Parnell helps prepare Oscar Pointer's taxes on Thursday. The Internal Revenue Service, United Way and other agencies have opened tax help sites in Davidson County and surrounding areas. SHELLEY MAYS / THE TENNESSEAN Comfort Johnson left the free tax preparation center in East Nashville with mission accomplished: Her 2008 federal income tax was complete, and she was expecting a larger-than-usual refund. "I'm no longer working, so it's a big help," she said Thursday. "Especially at tax time, a lot of people are in a bind, and they're able to get themselves out of a bind with this." The Volunteer Income Tax Assistance center on Gallatin Pike is one of the first free tax prep centers opening this week in Davidson and surrounding counties for those who make less than $42,000. "If used wisely, a tax refund can make a huge difference for their family," said Rachel Freeze, who is coordinating the VITA program. One goal is to get the Earned Income Tax Credit for more who qualify. As many as a fourth of those eligible in Nashville don't file for the credit, Freeze said. Income limits have been raised so that those with two or more children can make as much as $41,646 and still qualify for the credit. Even more could be eligible this year, as household members have lost jobs or income. One is Johnson, who qualified this year for the Earned Income credit, boosting her refund by about $1,000. A family with two or more children can receive as much as $4,824 with the credit. And the credit is refundable, which means the taxpayer gets the full amount no matter how little tax is owed, said Dan Boone, spokesman for the IRS in Nashville. The IRS, United Way and 20 other community agencies and financial institutions are working with Freeze's Nashville Alliance for Financial Independence to run the centers through April 15. The centers will file returns electronically for free on the IRS Web site, and most refunds will come within 10 days. "We're expecting 2.8 million returns to be filed in Tennessee," Boone said, and probably 90 percent would qualify to file free on the IRS Web site because their adjusted gross income is less than $56,000. Yet few take advantage. Of the 1.89 million returns filed electronically in Tennessee last year, only 130,000 were on the free IRS site, Boone said. New Fillable Forms let higher-income taxpayers also e-file for free on the IRS Web site. Using these forms is much like filling out paper forms, without prompts to claim credits or deductions. But a taxpayer comfortable with completing the forms can do that online and then file, Boone said. With e-filing and direct deposit, taxpayers can expect to get refunds within seven to 10 days, Boone said. "If you're looking for an easy way to save money, e-filing would be it." Freeze urges lower-income taxpayers to use that route rather than paying a tax preparer and getting a refund anticipation loan. A full-time minimum-wage employee would need to work 34.5 hours to pay an average preparation fee of $150 and an average interest charge of $100, she said. Oscar Pointer has had his taxes done by a private company. But he came this year to the VITA center after seeing a flier at his job at Goodwill. "One reason is it is free," he said. In addition to helping prepare and file tax returns, the program offers Second Chance bank accounts for people who don't have an account to get refunds by direct deposit, Freeze said. The accounts through First State Bank can be set up at the tax center at the Nashville Child Center, 4115 Gallatin Pike. By Dana Priest • THE WASHINGTON POST • January 23, 2009 WASHINGTON — President Barack Obama on Thursday removed the most controversial tools employed by his predecessor against terrorism suspects. With the stroke of his pen, he effectively declared an end to the "war on terror," as former President George W. Bush defined it, signaling to the world that the reach of the U.S. government in battling its enemies will not be limitless. While Obama says he has no plans to diminish counterterrorism operations abroad, the notion that a president can circumvent long-standing U.S. laws simply by declaring war was halted by executive order in the Oval Office. Key components of the secret structure developed under Bush are being swept away. The military's Guantanamo Bay, Cuba, facility, where the rights of habeas corpus and due process had been denied detainees, will close, and the CIA is now prohibited from maintaining its own overseas prisons. And in a broad swipe at the Bush administration's lawyers, Obama nullified every legal order and opinion on interrogations issued by any lawyer in the executive branch after Sept. 11, 2001. It was a swift and sudden end to an era that was slowly drawing to a close anyway, as public sentiment grew against perceived abuses of government power. The feisty debate over the tactics employed against al-Qaida began more than six years ago as whispers among confidants with access to the nation's most tightly held secrets. At the time, there was consensus in Congress and among the public that the United States would be attacked again and that government should take all means necessary to thwart the threat. The CIA, which had taken the lead on counterterrorism operations worldwide, asked intelligence contacts around the globe to help its teams of covert operatives and clandestine military units identify, kill or capture terrorism suspects. They set up their first interrogation center in a compound walled off by black canvas at Bagram Air Base, and more at tiny bases throughout Afghanistan, where detainees could be questioned outside military rules and the protocols of the Geneva Conventions, governing treatment of prisoners of war. As the CIA recruited young case officers, polygraphers and medical personnel to work on interrogation teams, the agency's leaders asked its allies in Thailand and Eastern Europe to set up secret prisons, where people such as Khalid Sheik Mohammed and Ramzi Binalshibh could be held in isolation and subjected to extreme sleep and sensory deprivation, waterboarding and sexual humiliation. These tactics are not permitted under military rules or the Geneva Conventions. Secrets leak out Over time, a tiny circle of federal employees outside these teams got access to some of the reports of interrogations. Some were pleased by the new aggressiveness. Others were horrified. They began to push back gingerly, as did an even smaller number of congressional officials briefed on the reports. Eventually, their worries reached a handful of reporters trying to confirm rumors of people who seemed to have disappeared. WKRN Channel 2 News Associated Press - January 23, 2009 1:55 PM ET NASHVILLE, Tenn. (AP) - Gov. Phil Bredesen is warning lawmakers to be ready to make some difficult spending cuts this legislative session. Bredesen is scheduled to present his budget proposal to the General Assembly in two weeks. The Democrat says it will include about $900 million in reductions from Tennessee's current annual spending plan. In the governor's words: "There will be something for every legislator to not like in this budget." Bredesen says that deep cuts - including a reduction in the number of state employees - will be necessary even after a the passage of a long-expected federal relief package. Bredesen has asked most departments to prepare spending cuts of 6% and 15% and will decide later which tier will be needed. By Chris Echegaray • THE TENNESSEAN • January 23, 2009 Nashville listened to its leaders — the governor, the mayor, and a vast coalition of churches, businesses and universities — and defeated an English-only measure by nearly 10,000 votes in Thursday's special election. No one predicted the massive turnout on the special election, one that inspired strong emotion from voters on either side. Ultimately, opponents said, the message that diversity is a good thing came through. "With the defeat of this amendment, the citizens of Nashville tell the rest of the country that we are an incredibly warm city with an entrepreneurial spirit," said Tom Oreck, a vacuum cleaner company owner who worked to defeat the measure. The final was 32,144 for English only and 41,752 against — at about 19 percent, the largest turnout for a special election in a decade. Opponents were well ahead when early voting totals came out just after the polls closed at 7 p.m. and never trailed. The measure would have forced all Metro Nashville government business to be done in English, with the council allowed to vote on exceptions. The city's legal department contended early on that conflicts with federal law would enmesh Nashville in litigation for years to come. By defeating the measure, Nashville will not be the largest city in the nation with an English-only rule in its charter despite dogged efforts by Metro Councilman Eric Crafton, who spearheaded the amendment. The city's size attracted the attention of national media. Crafton's arguments Crafton and his Nashville English First group argued that the city would save money in translation services and become unified as the result of more immigrants learning English. But even Crafton said he is glad the special election is over. He has been trying to get the charter amended for two years, first failing after former Mayor Bill Purcell vetoed a council vote on the issue and then failing to get it on the November ballot over a technicality in timing. "Like Roberto Duran said after his fight, 'No mas,'" Crafton said. "I think our community benefited from this debate, and I'm glad to have it behind us. We may have been on different sides, but we have to work to improve the education system, work through the budget crisis. Now, we have to be cooperative and work together." 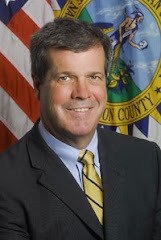 After the final tallies, Mayor Karl Dean also called for the city to move on from this chapter. "The results of this special election reaffirm Nashville's identity as a welcoming and friendly city and our ability to come together as a community — from all walks of life and perspectives — to work together for a common cause for the good of our city," he said. Election costs Even some who voted for the measure complained about the expense of holding a special election for it — nearly $280,000. Others didn't like the expense or the measure. "This is a waste of taxpayer money," said Ruth Hall, who voted at DuPont Tyler Middle School. "It's wrong, and I voted against it. "If I travel somewhere, I don't want the government telling me what I should be speaking and when." But those who went to the polls had ideas as diverse as Nashville itself. Julie Lopez, who is married to a Cuban immigrant and adopted a daughter from Colombia, voted in favor of the measure. "I just feel that it's fine to have government business to be in one language, an official language," said Lopez, who voted at the Central Pike Church of Christ. "I think, with changing demographics, there should be changing policies." Overall, the "o ne country, one language" sentiment pushed by Crafton to galvanize voters didn't resonate because Nashville is becoming cosmopolitan and comfortable with its diversity, said University of Illinois professor Dennis Baron, who has written extensively on English-only measures. "Nashville refused to be alarmed by unwarranted language endangerment," he said. "This is a good sign. As I've said, these things tend to pass. The forces against the measure worked very hard." Baron said English-only measures are often veiled attempts against immigrants and non-English speaking groups. The argument over English-only found itself framed around Latinos and illegal immigration, but it also would have affected the thousands of refugees the federal government resettles in Nashville. The defeat of English-only is a sign that voters recognize bad policy, said Maria Rodriguez, director of the Florida Immigrant Coalition who has fought against similar measures in that state. "Voters are not duped anymore," she said. "They know when they see bad policy that is going to be costly and that's not progressive. … I guess brown can stick around in Nashville." What are your feelings about this issue? WKRN Channel 2 Bridgestone Firestone North American Tire, Inc. announced Thursday it will cease passenger and light truck tire manufacturing at its plant in LaVergne, resulting in the loss of hundreds of jobs. In December, the LaVergne plant laid-off 148 hourly and 10 salaried employees due to a decrease in demand for passenger and light truck tires. The company said Thursday an additional 294 hourly, 31 maintenance and 60 salaried workers will be released beginning in mid-March when the company ceases production. "Based on current economic forecasts, it appears that the global economic crisis is going to get worse before it gets better. We are not immune from these challenging times," said Stephen Brooks, president of manufacturing operations. Additionally, a decreased demand for truck tires will result in the loss of 191 hourly employees, 34 maintenance and 34 salaried teammates beginning in mid-March. Brooks said if the economy improves, the jobs could be restored. "We hope that the economy will begin to recover later this year; as a result we also hope that we will be in a position to begin calling teammates back to work in the truck and bus tire production area, perhaps as early as the fourth quarter of 2009," he said. Bridgestone Firestone said truck and bus tire manufacturing will continue at the LaVergne plant with more than 700 employees. By Jose Antonio Vargas and Sarah Cohen • THE WASHINGTON POST • January 22, 2009 WASHINGTON — For the second time in U.S. history, the president's online portal switched owners. Out went the photographs of former president George W. Bush, which were posted until noon Tuesday. As the government officially changed hands, the presidential Web site WhiteHouse.gov began to serve the online vision and agenda of President Barack Obama. According to the site's first blog post, by Macon Phillips, a veteran of Obama's campaign and now the White House's new-media director, WhiteHouse.gov "will serve as a place for the President and his administration to connect with the restof the nation and the world." The top three priorities of the site, Phillips wrote, are "communication," "transparency" and "participation" — buzz words in online social networking circles. Congrats to over 36,600 students from accross middle Tennessee, southern Kentucky, and nothern Alabama took on the challenge of collecting the most alumonum tabs from cans that can be recycled, with all proceeds benefiting Ronald McDonald House of Nashvile. They collected 137,561 ounces of pull tabs, which equals 8,597.62. Twelve of Metro Nashville's public high schools currently involved in the high school redesign into Smaller Learning Communities are opening their doors to area business men and women who would like to share their industry knowledge and expertise with high school students. A new online Speakers Bureau, www.schoolvolunteers.org, has been created to help Metro teachers recruit professionals willing to share career advice with students. Through the Web site, teachers can search a database of professionals willing to address a classroom, while professionals can search a database for classroom speaking needs. Businesses or professionals interested in supporting MNPS Career Academies should contact PENCIL Foundation at 242-3167 or visit www.schoolvolunteers.org. WASHINGTON — In the inaugural address launching his presidency, Barack Obama on Tuesday drew on his sense of history and the needs of the moment — the same strengths that shaped the speeches that propelled him from obscurity to the White House in four years. In his very first sentence, Obama cited "the sacrifices borne by our ancestors" and said the confidence he feels in the face of two wars and the worst economic crisis in three-quarters of a century rests on Americans' remaining "faithful to the ideals of our forbears and ... our founding documents." More than most politicians, Obama has relied on his formal speeches to power his ambitious career. Tuesday's address — much of which he wrote himself — signaled a sharp break with the domestic and national security policies of the Bush administration and a reaffirmation of Obama's main campaign themes. 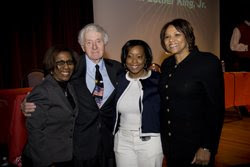 As in his keynote address to the 2004 Democratic National Convention, the speech that lifted the young Illinois state senator from obscurity, and in the Iowa Jefferson-Jackson Dinner speech that launched his first national campaign, Obama said he and his nation had "chosen hope over fear, unity of purpose over conflict and discord." Those words — hope and unity — have been the consistent keynotes of his political rhetoric. They now will be tested in the toughest of crucibles, as he confronts a deeply anxious nation that has attached its hopes strongly to him. 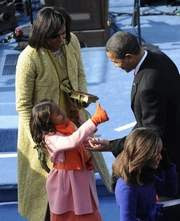 In turn, Obama was at pains in this somber inaugural to turn the burden back to them. "For as much as government can do and must do," Obama said, "it is ultimately the faith and determination of the American people upon which this nation relies." "What is demanded," he said, are old virtues and values — "hard work and honesty, courage and fair play, tolerance and curiosity, loyalty and patriotism." 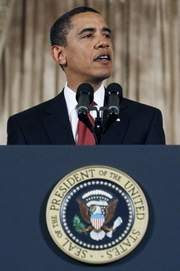 In the few substantive passages in the speech, Obama signaled a change from the Bush administration. Alluding to the almost-trillion-dollar stimulus package he outlined to Congress even before he took the oath, he called for "bold and swift" action to stop the slide in jobs, manufacturing and housing. He also alluded to new initiatives, not yet specified, in energy, education, health care and technology. Turning to national security, Obama rejected Bush's contention that the terrorist threat necessitated some sacrifice of privacy and civil liberties, saying, "We reject as false the choice between our safety and our ideals. ... Those ideals still light the world, and we will not give them up for expedience's sake." The biggest and most obvious change that Obama represents went almost unmentioned by him: the fact that he is the first African-American or mixed-race man ever elected president. He noted the uniqueness of the fact that "a man whose father less than 60 years ago might not have been served at a local restaurant can now stand before you to take a most sacred oath." But as in his campaign, Obama did not identify himself as "the black candidate for president" and he cast his appeal broadly, not toward a targeted audience. Echoing not only his own earlier words but a major theme of President George W. Bush's inauguration, he called Tuesday for "a new era of responsibility." Obama turned back to the first president, quoting George Washington's words from the winter of Valley Forge, when "nothing but hope and virtue could survive." "With hope and virtue, let us brave once more the icy currents, and endure what storms may come," he said. It was the bookend to the closing words in Boston more than four years ago, when he invoked "Hope — hope in the face of difficulty. Hope in the face of uncertainty. The audacity of hope." What speeches can accomplish, they have delivered handsomely for Barack Obama. Now, it will depend on his deeds. Action still needs state approval to be final By Michael Cass • THE TENNESSEAN • January 21, 2009 Visitors to some Nashville Farmers Market restaurants could enjoy a beer or a glass of wine with lunch before long. The Metro Council approved a lease amendment Tuesday that would allow the eateries to sell alcohol, subject to approval by the state, which owns the land on which the city facility sits north of downtown. The council also approved a nearly three-square-mile tourism development zone around a proposed downtown convention center. The city will be able to use the difference between existing sales tax revenues within the zone and the amount generated by business brought in by the new convention center for up to 30 years to pay for construction of the center if the council signs off on the $635 million project. The revenues the city and state collect from the area and use for other purposes will not be affected, Metro Finance Director Rich Riebeling said. No one knows how much new money the development zone might generate. Phil Ryan, executive director of the Metro Development and Housing Agency, which is spearheading the convention center project, said it would take a month or so to determine the baseline tax collections in the zone. The roughly 1,800-acre area will stretch north to Jefferson Street, east to Interstate 24, south to Interstate 40/Interstate 65 and out to 21st Avenue at the southwest corner. It will be about 120 acres smaller than the maximum size allowed by the state. LP Field and Sommet Center will be excluded. Ryan said in an interview that he and other facility planners believe the development zone is the right size, based on where a new convention center might spur development. Councilman Eric Crafton raised questions about the zone and ultimately cast the only vote against it. "How can we even determine that this is the area that we need?" he said. Riebeling said that if the zone generates more money each year than officials expect, the city would pay off its debt sooner and then eliminate the zone. More income chances Jeff Themm, director of the Farmers Market, said allowing alcohol sales would generate needed income. He said he envisions some of the market's seven restaurants, which are only open at lunch, selling beer and wine. Themm said he hopes the restaurants can open at night in the next couple of years. In the meantime, the market could attract some evening events at which beer, wine and liquor would be sold, he said. The council voted to defer for one meeting a more controversial bill about alcohol sales. That legislation would ban most sales of single bottles and cans of beer downtown in an effort to control vagrancy, litter, panhandling and public intoxication. Critics say the measure would do little to solve those problems and would hurt convenience stores' bottom lines. Tennessean MIDDLE TENNESSEE Hands On Nashville is hoping to enlist new volunteers this week through a promotion partnership with Starbucks. The coffeehouse chain will give customers a free tall coffee and a button that says "I'm In" if they pledge to do five hours of community service during 2009. People will be directed to local affiliates of the Hands On Network, which is Hands On Nashville in Middle Tennessee. The promotion runs Wednesday through Sunday. To learn more, check out Hands On Nashville's Web site, www.hon.org, or call 615-298-1108. The national organization's Web site is www.handsonnetwork.org. WKRN Channel 2 News Posted: Jan 17, 2009 05:03 PM CST Updated: Jan 18, 2009 12:01 AM CST Despite the cold weather, lines stretched out the doors at the election commission Saturday morning, as voters waited to cast their ballot for the special election. By this time next week, Davidson County voters will have decided if English should be the official language of Metro government. Voter Caroline Dubois says she couldn't believe how many people showed up, "We were shocked, it was the biggest line I've seen." At times, that line was out the door and all the way out to the curb. Allison Schachter says the issues on the ballot were important enough to stand in line for, "I was upset by the ballot initiative and I wanted to vote against it and I wanted to vote early." Even those who turned out early had to wait patiently for their turn at the voting machines. The election commission says they already had people lined up forty-five minutes before the doors opened. "I think it's really exciting to see so many people out here who care," Schachter tells News 2, "Whatever their opinion is." James Johnson voted for the English First proposal, and tells News 2, "To me, it doesn't make sense. If a person wants to come to this country and participate in the political things of this country, they ought to speak the country's language." Kevin Millen voted against the amendment, "I think it's not very smart thing for us to be doing. A waste of time, not good for our image and unnecessary." Election officials expect voting on the day of the January 22nd special election to be just as busy. Departments submit multiple contingency plans By Theo Emery • THE TENNESSEAN • January 18, 2009 After the bitter acrimony surrounding last week's surprise election of Republican Speaker Kent Williams, the General Assembly's real work has yet to begin: passing the state budget that Gov. Phil Bredesen will propose in his State of the State address on Feb. 9. The 2009-10 budget, which is in the final stages of preparation, anticipates a shortfall of about $712 million in revenues next year, and would require about $900 million in cuts across most departments. The cuts that departments submitted to Bredesen late last month include more than 2,000 jobs, although the governor said he would be "astonished" if that many people were laid off, calling it a worst-case scenario if little federal aid comes from Washington and the deepest cuts were needed. But he said it would be almost impossible to avoid layoffs altogether, given the severity of the downturn and the state's declining revenues, which he said were "right up there" with other states hit hard by the economic downturn. "A part of my challenge here is not only to balance the budget but also to understand that this is certainly the worst financial situation in the state since the second World War," he said. "It's not going to be a pretty budget when you look at it." The Tennessee State Employees Association said the governor is not looking hard enough for other ways to save money and accused him of bad faith in his budget setting. The association is particularly angry about plans to ask lawmakers for legislation that would relax civil service rules and make it easier to lay off employees. "We have balanced the state's budget through difficult times in our past and under numerous administrations and never before has a governor requested such power to accomplish the task," the association's executive director, Jim Tucker, said in a statement. The governor asked his department heads to establish multiple stages of cuts. The first tier averages just over 8 percent cuts, which departments will adopt under almost any scenario. Then, departments were asked to prepare another plan to cut an additional 6 percent, which would be necessary should the federal stimulus package not provide adequate aid for the state. The two tiers would total about 14.5 percent. Finally, the administration asked for contingency plans for 5 percent more in cuts, in case the economic situation gets worse, which the governor said is possible in the difficult-to-predict economic environment. "This year, you make projections and they can be off by $500 million in either direction in terms of the tax revenues of the state," he said. A few departments and areas of spending were able to avoid major cuts. Bredesen said he plans to keep the state's Basic Education Program school funding intact, and allowed the Department of Corrections to avoid cuts in what would be the first round of cuts, though not in the second. TennCare hit hardest In many cases, the cuts required of departments total millions, and even tens of millions of dollars. In December, the administration's reduction guidelines asked the Department of Children's Services, for example, to find $23.6 million in the first round of cuts and $26 million in the second, totaling almost $50 million. The Department of Safety was asked to cut about $8.5 million in the first tier and $7.7 million in the second, for a total of about $16 million. The Department of Health was asked to find about $11 million in the first tier and about $10 million in the second. By far, the biggest cuts requested were from TennCare, the state's expanded Medicaid program. In the first round, TennCare was asked to find $205 million in cuts, and $181 million in the second round. The $386 million total represents more than a third of the total cuts across the state budget, according to the guidelines. The state recently won a court ruling that eventually could allow the state to save money by dropping some TennCare recipients who are no longer eligible but have remained in the rolls because of a court decision from the 1980s. The federal stimulus package under discussion in Washington likely would boost the federal contribution toward TennCare, the governor said. Gordon Bonnyman, founder of the Tennessee Justice Center and an advocate on behalf of TennCare recipients, said he hopes the stimulus package would prevent any TennCare cuts. "That should be more than enough to offset whatever the state thought it would have to cut in TennCare," he said. Lawmakers appear resigned to the grim task ahead. Lt. Gov. Ron Ramsey, the Republican Senate speaker, said he agrees with Bredesen "that we live within our means, that we balance the budget without a tax increase, that we make the tough cuts because we have to. "The only piece of business we have to conduct between now and the time we adjourn is to pass a balanced budget," Ramsey said, "and I feel confident that we'll do that with the basic philosophy the governor has laid out." News Channel 5 NASHVILLE, Tenn. - With temperatures dipping down near zero Thursday night, your furnace will have to work overtime. That's why Nashville Electric Service is starting to work with customers who will get hit with a big bill thanks to the cold weather. NES President/CEO Decosta Jenkins outlined the reasons behind the big bills for Metro Council members and told them what the utility can do to help. People are doing what they can to stay warm. "You can look around, all over the city, all over this country people are hurting," Jenkins said. At NES, managers are doing as much as they can to ease the pain of high electric bills. "We'll show as much empathy as we can, we'll work with them as long as we can," he said. Several Metro Council members came out Thursday night to get the back story on skyrocketing monthly statements. Jenkins put much of the blame on the Tennessee Valley Authority. The electric wholesaler has raised the rate it charges NES 34 percent since April; nearly 24 percent of that is a fuel surcharge. Combine that with colder weather over the last few months. Also, because of holidays, many customers had 34 days on their bill instead of the usual 28. "We know these four factors are having an impact on everybody," he said. If customers ask, NES will take the average of their last three December bills and let them pay the average and spread out the difference over three months. NES will also waive late fees and be more lenient on cut-offs. "I applaud you in being creative in the things that you've mentioned," said Metro Councilwoman Vivian Wilhoite. Still, some council members wonder how people will get out from under mounting electric bills. "Even if we make arrangements, what happens the next month if it's 400 or 500, and now you're $300 behind, how do we continue and stop the snowball," said Metro Councilman Robert Duvall. Still, any little bit of help might make a difference as the temperature continues to drop. Changes are also coming to the NES call center. Right now, 80 people are taking calls and setting up special payment arrangements. They've started mandatory overtime for people and they're hiring 45 temporary workers to man extra phone lines so customers can get through in a decent amount of time. NES hasn't raised the actual rates it charges since 2006. But, there is a planned, 3-5 percent increase in the rate next year. By COLBY SLEDGE • THE TENNESSEAN • January 15, 2009 Metro Nashville Public Schools will close Friday due to forecasts of extreme cold, the district announced today. In a news release, the school district cited temperature forecasts as low as 0 degrees Fahrenheit during the morning, when students would be waiting for buses or walking to school. The district has closed in the past due to extreme temperatures, including for extreme heat in 2007.The closing will result in a four-day weekend, as schools will also be closed Monday in observance of Martin Luther King Jr. Day.Check back at Tennessean.com for more info. Worker group says cuts not needed By Theo Emery • THE TENNESSEAN • January 15, 2009 Gov. Phil Bredesen said that more than 2,000 state workers could face layoffs because of Tennessee's budget crisis, a belt-tightening measure that the state employee's association said is not necessary. Bredesen said budget-cutting proposals submitted by each of his departments last month would trim the state's payroll by more than two thousand employees, although he did not give a specific number. "I'm going to do everything I can to minimize layoffs, more so than I usually would, because I think this is a tough time to be looking for a job," he said. Jim Tucker, executive director of the Tennessee State Employees Association, said that layoffs are not necessary, and the administration is not looking carefully enough at the state budget to find places to save money. He said the state could instead look for savings in its contracts and programs, create four-day workweeks and shortened workdays, or require employee furloughs. "Why would the governor want to lay people off and put them in the unemployment line when there are other options?" he said. The Governor said he believes that he may be able to reduce the number of layoffs that are contained in the department budget plans that were submitted to him, but he said it will be impossible to balance the budget without some layoffs. "Those are draconian cuts — there's no way to get there without substantive layoffs," he said. The state is facing a budget shortfall of as much as a billion dollars this year because of sharply declining revenues. State tax revenues have been steadily worsening as the economy sours; last month's sales tax collections recorded a record decline. Most departments were asked to deliver proposals to cut their budgets in multiple stages: an initial cut of roughly 8 percent cut, then a 7 percent cut if no federal aid is forthcoming. Departments were also asked to create a plan to cut another 5 percent in case the state's financial situation gets still worse. "This is the worst financial crisis the state has faced since World War II," Bredesen said. The governor plans to submit his 2010 budget to the legislature on Feb. 9, but he probably will require an amendment after the extent of the federal stimulus package — which is still under discussion in Washington — is known. Bredesen plans to ask lawmakers to pass a legislative package that will loosen the state's civil service rules, which he said would give him flexibility in hiring, transferring and laying of employees. The administration originally planned to ask for passage of those bills this week during an organizational session of the legislature; instead, he will ask the General Assembly to take it up after an upcoming recess. Department heads expect cuts By Michael Cass • THE TENNESSEAN • January 15, 2009 Metro kicks off its 2009-10 budget process today with a case of the jitters as it contends with a badly bruised economy and slow sales tax collections that could lead to significant layoffs and service reductions. Metro Finance Director Rich Riebeling will meet with department heads at 1 p.m. at the Nashville Public Library to give them Mayor Karl Dean's instructions, including preparing for cuts as high as 15 percent. Dean, in his second year in office, must submit his recommended operating budget to the Metro Council by May 1. Dean's first budget was a painful one, including 200 layoffs, another 127 positions eliminated and 5 percent cuts for most departments. Although the size of the overall budget actually increased slightly, a 4.8 percent increase for Metro schools meant most other areas had to sacrifice. Dean's second budget promises to be even tougher, said Riebeling, who expects revenues to decline unless the economy turns around. The budget year starts July 1. "We're going to be looking at some very difficult choices," Riebeling said. "Last year was difficult, and this year is going to be exponentially more difficult." Riebeling said he will ask department leaders to plan for several types of cuts in the coming weeks. He said he wasn't ready Wednesday to say what the scenarios would be, but he didn't expect to ask for cuts larger than 15 percent. Direct service a priority Riebeling also will ask departments to focus first on cutting areas that don't provide direct services to the public. "After that, we'll have to prioritize," Riebeling said. "It's going to be hard to get through and keep the city moving forward, but that's what we're committed to doing." Asked if any departments might have to merge in a cost-saving effort, Riebeling said nothing can be ruled out yet. Councilman Randy Foster, who represents part of south Davidson County, said the state's lagging sales tax collections will hurt the city. Metro gets 2.25 cents from every dollar spent here on taxable goods, with two-thirds of that revenue going to schools. "Whatever flows out of the state to cities and counties will be less than it was before," Foster said. "People are really pulling back from spending on large-ticket items — and even small things as well." By Jenny Upchurch • THE TENNESSEAN • January 15, 2009 Friday morning's temperature will dip near zero in Middle Tennessee, prompting Metro Water Services to warn its Nashville customers to take steps to keep pipes from freezing. Here are tips from Metro and other agencies: >> Open bathroom and kitchen cabinet doors if you have a water pipe close to an exterior wall. This will allow your home's warmer air to reach the water pipes. >> If you have had problems with frozen pipes in your home in the past, Metro Water Services suggests that you run a small trickle of water, about the size of a pencil lead, from a cold water faucet. It's best to use a faucet not in regular use so someone does not turn it off. >> If you're going away for a weekend trip or a house is vacant, make sure to leave the heat on. Don't set it any lower than 55 degrees or your pipes may be in danger of freezing or bursting. Sealing up your house's exterior can help, too. >> Cover foundation vents. >> Insulate exposed water pipes. >> Seal all cracks in exterior walls and foundation. >> Remove all exterior hose connections and insulate the hose bibs. If the worst happens To be ready for frozen pipes, keep this in mind: >> Locate the water shut-off valve inside your home. The ability to quickly close this valve may prevent damage if an interior pipe bursts. The shut-off valve may be in the basement, under the kitchen sink, in a utility closet, near the hot water heater, or in a crawl space. If you think you have found it, be sure to test it. If you cannot locate your inside shut-off valve or do not have one installed, contact a plumber. >> Never try to thaw a pipe with a blowtorch or any other open flame. Do not use electrical appliances such as heaters in areas of standing water. If you suspect your pipes are freezing, wrap towels that have been soaked in hot water around cold pipe sections. Mic Check on 19 feat. 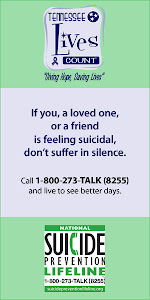 Ernie Allen 's "Let's Talk"
Turn up your speakers and listen to this important message! Traffic solutions sought as McCrory Creek business park moves forward By Andy Humbles • THE TENNESSEAN • January 14, 2009 How the proposed Harding Place extension may or may not fit into plans for a new business park to be built on 184 acres near McCrory Creek Road and Elm Hill Pike is still uncertain. But residents who live nearby and developer Bert Mathews have been working together in attempts to come up with their own workable solutions to the traffic needs that will be generated by the planned McCrory Creek Business Park. "The Harding Place extension would be very beneficial in regard to the Mathews project,'' said Charles Dyck, one of the nearby residents comprising a steering committee that has been working with Mathews. "In my opinion we need a plan to accommodate traffic assuming the Harding Place extension does not happen,'' Dyck said. "We've been working with Mr. Mathews and the city to develop a workable plan, including upgrading Stewarts Ferry Pike and Elm Hill Pike.'' The McCrory Creek Business Project has gone through the Metro Planning Commission and passed two of three required readings for approval by the Metro Council. The project is planning about 2.5 million square feet of office space with a retail component and hotels as well. The project has a Specific Plan (SP) zoning designation, which requires a development be done strictly by the plan approved or go through the approval process again. The Harding Place extension is a proposed road project that would connect Harding Place to Interstate 40. There are still questions about the path the Harding Place extension will take if it gets built. Metro Councilman Bruce Stanley wants the Harding Place extension's route to be able to access the McCrory Creek Business Park. The Harding Place extension would be a state project. "The Harding Place extension would be a wonderful thing to have happen, but it's been on the plans for decades,'' Mathews said, "and we want to make sure our project isn't, in the short term, dependent. "The steering committee has asked for a number of specific items in the SP Zone, and we've worked through a long process to get there. It includes buffering; very specific land uses on different parcels. We worked extensively on pre-blast surveys, and we are continuing to talk about a couple of off-site traffic upgrades.'' Stanley is also seeking movement with Metro officials to expedite a widening project for Stewarts Ferry Pike, from two lanes to five lanes, that has been designated as a long-range project. The councilman believes Stewarts Ferry Pike is operating well above capacity. "This will be a substantial corporate center,'' Stanley said. "The residents have been supportive if there is appropriate access, and I'm appreciative of Mr. Mathews for working with the residents. It's time for city and state officials make these (roadway) improvements immediately in conjunction with that business park.'' The final vote was deferred for a second time on Nov. 18 and is now scheduled for Jan. 20. The deferral by Stanley was because he wanted to use the time to attain additional support and commitment from the state and regional planners regarding improvements of the Harding Place extension, Stewarts Ferry Pike and Lebanon Pike. The councilman believes planned upgrades to those three roads would positively impact the McCrory Creek Business Park. Stanley has recently sponsored two resolutions passed by the Metro Council requesting state authorities and regional planners commit to these infrastructure upgrades when funding is available. Stanley said he will ask the council for final approval of the McCrory Creek Business Park based on the collaboration of residents and Mathews. State gets increase in aid, applications By Jenny Upchurch • THE TENNESSEAN • January 14, 2009 Many more Tennesseans will get help paying utility bills this year for two reasons: The state has three times the federal money to distribute and applications for aid have jumped dramatically. "We hope to more than double the number helped this year, at least 120,000 households," said Michelle Mowery Johnson, spokeswoman for the state Department of Human Services. Tennessee is part of a record surge nationwide of people in need of help staying warm. About 7.3 million households are expected to get fuel aid this winter, a 25 percent increase, according to a survey released Monday by the National Energy Assistance Directors' Association. Statewide, Tennessee has seen a 40 percent increase in requests for aid, with a 22 percent increase in Nashville in the past six months. The Metro Action Commission has already assisted 6,000 households since July 1, more than all who received aid in the entire previous year, says spokeswoman Lisa Gallon. The Nashville agency expects to help 8,360 households with the money allocated, $5.36 million, compared to $2.2 million last year. In recent years, thousands who were eligible for aid went without in Tennessee because the federal funds ran out. This year, agencies hope the extra money will leave out fewer. But, Johnson said, "there's never enough money for the need out there." Priority goes to the disabled, the elderly and families with children 5 and younger. "They go to the head of the line because they are the most in need, the most fragile," she said. The federal government last fall nearly doubled fuel assistance, releasing $5.1 billion to states. Tennessee received $80 million, almost triple its allocation of Low Income Home Energy Assistance Program money last year. The human services department allocates the federal aid to 19 community service agencies. To extend the heating aid, Gov. Phil Bredesen announced last month that the state would use $5 million of the federal heat aid to match private contributions. The state will match $2 for every $1 from a private source, such as a utility-sponsored charity. For example, Metro Action can draw down as much as $460,000 to match contributions. More requests for help Some money is also being held back to help with air conditioning bills this summer. In Nashville, Gallon said, requests for help with rent and mortgage payments are increasing along with requests for help with utility bills, and many people are first-time applicants. The Associated Press contributed. Posted: Jan 12, 2009 05:31 PM CST WKRN Channel 2 News The Nashville Public Library is teaming up with the Second Harvest Food Bank for its third "Food for Fines" campaign. For the next 10 days, members with overdue fines can pay with food, instead of cash. "We thought this was the perfect way to allow our patrons to get their accounts current, half their overdue fines and do something really good for the hungry in the community by trading in $1 for one canned good," explained Deanna Larson. Customers seem to like the idea. "I went down, got some cans of food came up here, got my fines taken care of," said Terry Harris. "Somebody gets a good meal tonight and [I] and the library are square where I can get on the Internet and get in touch with my family again." Last year's Food for Fines drive went so well, the libraries collected more than 44,000 pounds of food. Second Harvest Food Bank officials said they've seen the need increase 22% over the last year. The Food for Fines campaign continues through January 22. Peanut butter, canned goods, macaroni and cheese and dried items, like rice and beans, are among the most needed items. Board told to cut costs at indigent care facility By Michael Cass • THE TENNESSEAN • January 13, 2009 Metro must look for "more viable long-term options" to fund the city's cash-strapped safety-net hospital after years of costly subsidies and loan extensions, Mayor Karl Dean wrote in a letter to the hospital's board chairman. Dean told Metro Hospital Authority Chairman Waverly D. Crenshaw Jr. that his administration would look at ways to reduce Metro's expenses in the operation of Nashville General Hospital at Meharry. The city gave the hospital authority a $47.3 million subsidy — reflecting a 5 percent cut — for the fiscal year that started July 1. General Hospital regularly struggles to make ends meet because so many of its patients have little or no health insurance, making it tough to get reimbursed for many of the services it provides. "Today I have asked the Finance Director to begin looking at options that would continue healthcare delivery for our indigent and under-served citizens, but at a lower cost to the Metropolitan Government," Dean wrote Crenshaw in a letter dated Jan. 9. "I have instructed him that all options should be on the table." Crenshaw said he recognizes the economic reality and is pleased that Dean wants to keep funding indigent care. "We certainly agree that we need to be good stewards of the city's money," he said. "I'm encouraged that the mayor put all the options on the table." Councilman Jerry Maynard, the hospital's most vocal defender on the Metro Council, said he was disappointed Dean didn't consult him and other stakeholders before writing to Crenshaw. He also was disappointed in the letter's tone and content, he said. But Maynard, who criticized Dean's administration last fall for not offering more enthusiastic support for the hospital, said he would work with the mayor to find solutions. "This is an opportunity to work together to make sure every working family has access to high-quality health care," he said. Deficit is about $2M Dean also said the hospital authority must significantly cut costs or increase revenues over the next six months because the city doesn't plan to help the hospital finish the fiscal year. Metro gave the authority an $11.5 million loan extension last February so it could get through the previous year, running the authority's loan to nearly $32 million. "The City cannot provide additional revenues … this fiscal year to bail out the anticipated deficit," the mayor wrote. Metro Finance Director Rich Riebeling said the deficit is at least $2 million. The hospital authority runs General Hospital independently of the city's central government but receives funding from it. Crenshaw said the authority would look at other cities' hospital operations and the role of the private sector in those places; cut costs wherever possible and continue its marketing campaign. "There's nothing we will not look at," he said.